Don't laugh, in my bed under the covers with a good book. And Yes I love Sheila's books. 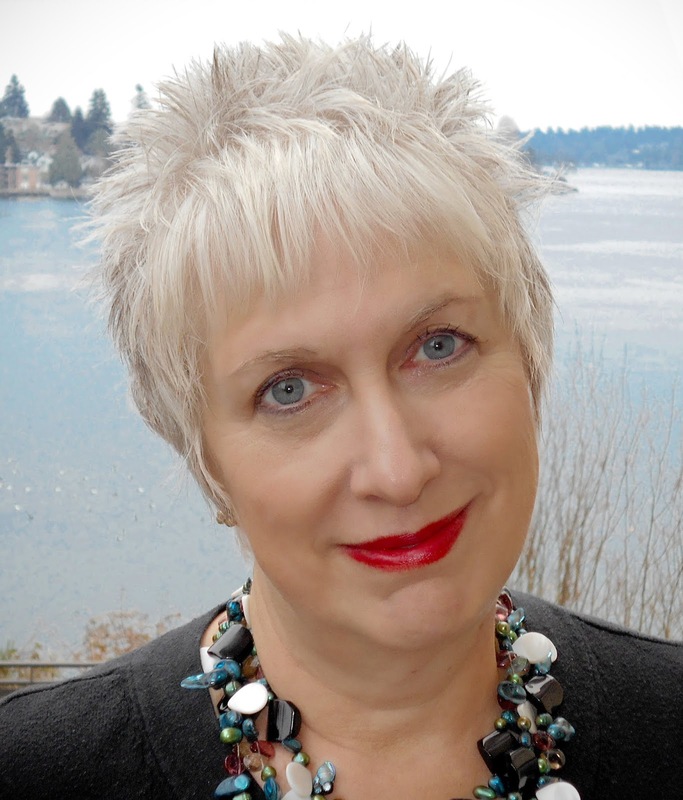 Sheila's novels are captivating and special. My favorite place to relax and get away is the beach. I feel like a new person and love this setting. I do love the beach. It's like a soul filler for me. When I had a young family we used to go to Lake Huron for a week during the summer. What a special and charming town and a 7 mile long beach where we spent the day. I miss that place and pine for it. What wonderful memories you made! And yes, I love her books !!! Oh, that sounds lovely. I love rockers! I'd love to have a beach house! I've vacationed at the beach every few years, but I really don't like the high heat & humidity in the summer - spring & fall would make me much happier - on a porch with a pile of books. I'm in desperate need of a beach fix. It's also one of my favorite escape outlets. I haven't read the Moonlight Harbor series. I love to relax on the beach especially with my granddaughter. I have never read any of Sheila's books. Thank you for the chance. You're in for a treat, Patty B. She writes wonderful, heartwarming contemporary romance with plenty of great humor. The photos I've seen of Aruba are gorgeous! In a former life, I lived near Lake Michigan....the best beaches in the world....if you did not mind your feet being burned in the summer. I enjoy the beach but to be honest, every time I go, I get this hypnotic feeling of simply looking at the horizon and reading never seems to happen. I do love to read - on my couch with my feet on the coffee table and a wonderful story in front of me. Have not read any books by Ms Roberts, this certainly looks like a good one for me to start. Have we talked about this, Annette? I grew up near Lake Michigan. And I hear you on the hot sand. Boy howdy, did my poor feet suffer! I love going to the beach as well as scrapbook retreats anywhere! I get time away and get to be creative with the photos of the people I love - can't beat it! I admire those of you with scrapbooking talent! Hubby built a deck in the back yard. Complete with a water fall fountain. The most relaxing place to read. Birds, squirrels and hummingbirds rin around. I have read Ms. Robert's books. But not this series. Thanks for giving us a chance to win. That deck sounds so soothing. I love water fountains. Me too, the Beach. I haven't read any of Sheila's books. Would love to try one. TY for the chance. The beach seems to be a popular choice! I like to go to the beach. If not possible, I like to sit on the patio in my rocking chair with a small table to hold my iced tea and lemonade. I've read the first 2 books in the Moonlight Harbor series. As a life-long resident of Michigan, I can say I'm a beach person. No matter where you live in Michigan, you are normally never more than 1 hour away from one of the Great Lakes and some incredible beaches. I lived in NC for about 14 years and visited the Outer Banks Islands and those beautiful beaches as many times as I could. I don't swim or take part in any water sports, etc, but I love my beaches. I grew up near Lake Michigan and I agree. The beaches there are beautiful. Since I don't live near a beach I go anywhere where I can find water. The Mississippi River is near my house and there's a path on the bluffs above to walk. My all-time happy place is Yellowstone �� I’ve read several of Sheila’s books, plus the first two Moonlight Harbor ones. I've only been to Yellowstone once and I was twelve but it made a lasting impressing on me. So beautiful. I love sitting next to either a lake or a river. I love Shelia's books they always make me feel warm & cozy inside. I love spending time at the beach. Thanks for this amazing chance, I'm keeping my fingers & toes crossed. Love Sheila's books, I have read only 2 or 3. This one sounds just as great! My husband and daughter love to vacation at the beach so we usually go for a few days. I have read a lot of Shelia's books and have loved them all. If I need to get away I usually either go to the beach, Fort Bragg, Ca area or into the mountains by a lake. I love being somewhere where people are not. Moonlight Harbor series was the first books I read of Sheila's and have been a big fan ever since. I love her books! Not a beach person, so my go to place to read is my living room recliner. I haven’t gotten to read any of Sheila’s books yet. She’s a new to me author. I’ll have to get to my library and pick out a few of her books. I loved reading the excerpt, and have to find out what happens! Thanks for the opportunity! Carol in Michigan. I do like the beach but to read I enjoy my comfy chair and puppy cuddled up besides me. I read the book before this one and can’t wait to read this new one! My place to getaway is our cabin. I have been reading Sheila's books for years! Bikini Season is one of my favs! 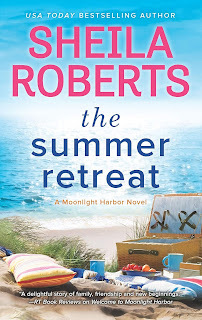 Yes, I've started on the Moonlight Harbor series! I love Sheila's books. My favorite are the Icicle Falls books and especially the ones about Olivia and the wonderful lodge. I wish she and her lodge were real so I could visit them. I love an uncrowded beach but hubby as always loved the mountains so I usually have to get my beach fix through books. I've just found you as an author and started in Moonlight Harbor! I love the besch..the sun, the sand. Thank you for the great chance. The beach is my favorite place to be and recharges my soul. Taking a few books and sitting on the beach reading as I listen to the waves and feel the water on my feet and the sun on my body is heaven. Sheila is one of my all time favorite authors. My favorite place to escape is the pages of a good book. I have read some of Shelia Robert's Icicle Falls series. I am soooo looking forward to reading this! I love Shelia Roberts books and buy every one I find. Love the beach & This series! Some one needs to send me to the beach until I can behave myself! I love the Colorado Rockies, especially love going to Grand Lake, CO! You are one of my favorite authors. I've read most of the Icicle Falls series. Haven't read any Moonlight Harbor yet. I just ordered all three Moonlight books from Amazon. Can't wait to make this my summer, at the pool with my daughter, reading :) They sound great! This sounds like an amazing book with a great story line. I hope to make it to the beach this year. A tropical beach sounds nice as well, but I'm sure with my schedule as a mother/baby night nurse it won't work out for me this year. I'll surely be looking forward to reading this book this summer. I like to escape in crafts. Quietly focus on creating something beautiful. Yes I am enjoying this series a lot. Can't wait to meet more of the town folks. Especially the hardware store lady. The beach is a happy place for me too. When I can't get to a beach, I escape into the pages of a good book. I have enjoyed several of Sheila's books. A personal favorite is Three Christmas Wishes. 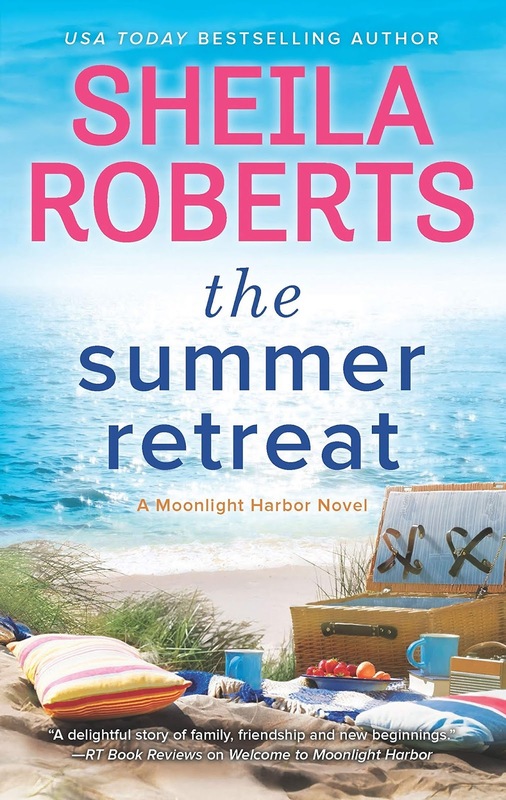 The last two books I read were Moonlight Harbor books.I read Winter Beach then I was offered to get mailed a copy of Welcome to Moonlight Harbor. Someone I had stayed with suddenly showed up with a bag of my books and in there was Welcome that I already had bought and read. I reread it. Now I would love the third book. I have trouble finding certain books so I would be so delighted to win this one. I don't really have a place to get away from it all. I have read several of your books and loved them. Your new series is one of them. Curled up in my favorite chair in living room heaven! I love e to read in my bed!Thanks for the chance!Would love to read your book! The beach is my happy place, and I'm getting ready to go there for a week. I haven't read any of her books yet but would definitely love to start one, especially while I'm at the beach. LOL!! Really looking forward to reading this book and getting an update on the motel. Any where I can open a book is my happy place to read a book! Reading just makes me happy. I haven't read any of Sheila's books but would love to win this one and read it. It sounds wonderful, thank you for the chance! I have not read any of Sheilas books but this one would be a great place to start. Thanks for the chance!